By all means, the guys from Austin, Texas based Prog Metal act Ethereal Architect deserve an apology, as their sophomore album has been due a review for a couple of months. Sorry dudes, but all kinds of things have happened to cause this delay. First of all, there was the usual Summer pile-up at Headquarters Office, which caused my editor-in-chief a delay a delivering everything that came out during those two months in one big package. In essence, I was given Monolith as part of a 44-album package at the end of August, following a 39-album package given me a month earlier. Holidays interfering, I obviously had hardly gone through half of the first package when the second package fell upon my shoulders. Which is when a major change happened in my professional life, causing me to be cut off from Internet access for a couple of months. This in its turn caused me to suffer from a severe writer's block for a while. In fact, I've only come out of that impasse in mid-December, at which time the editor-in-chief of course pushed some more reviews-to-be-done my way. Since then, I've been trying very hard to catch up, but with less free time after work, I've obviously been in a tight spot. Hope you understand. 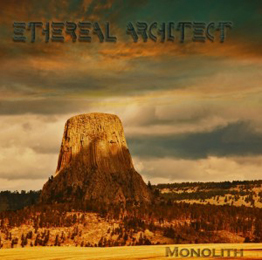 Meanwhile, back to the matter at hand, which is Ethereal Architect's incredibly great music! First however, the historical bit(s). EA was founded during 2006 in the city of San Marcos, Texas. The band self-released its debut album Dissension in December 2007, which got 'em a “Demo Of The Month” citation from Germany's Rock Hard magazine. The band, currently consisting (possibly since the beginning – I have no way to confirm at the moment) of lead singer Adam Contreras, guitarist/ keyboardist/ backing singer (also programmer & recording/ mixing engineer) David Glass, bassist Thad Stevens, and drummer Jake Koenig, subsequently moved to Kyle (a suburb of Austin). Their top live experience so far consists of having supported Doro Pesch. As just mentioned, Glass is also the band's recording and mixing engineer, and most of the sophomore album was recorded at Kyle based Throne Stone Studios. However, acoustic guitars and the additional vocals of the album (courtesy of Aaron Welch, Serafia Jane, Ken Liao, Raynor Choate, Rick Clark and Drew Heaton) were recorded (still at TSS) by one Lori Trevino, and for the drums Glass moved Koenig to Austin's Penny Creek Studios. Since the release, the album has already received airplay on several radio stations, and gotten rave reviews such as “Sensational guitar work...consistently brilliant quality” (translated from German – Lothar Hausfeld, Musikreviews), “A phenomenal band” (Jay Chandler, Heavy Metal Universe), “This is one unsigned band that deserves your attention” (Rick Gebhardt, Decoy Music), “Intense rhythms and intricate guitar work...instrumental wizardry” (Pete Pardo, Sea Of Tranquility), and my favourite...because it's so absolutely true... “One of those diamonds in the rough that I infrequently come across” (Scott Alisoglu, Blabbermouth). And I'm sure Scott referred to the band's status within the music industry when calling EA a diamond in the rough, you know, because the sound on this album is as incredible as the music. Talking of which, it's a positive thing to know that Glass also does programming, because that's surely something the band needs in live conditions. I mean, even if the band could occasionally hire a (qualitatively high-standard) extra keyboardist to fill in the keyboard parts on stage, there's still the multiple times in EA's music where a second guitarist is needed (hey, you know, maybe Contreras provides those extra guitar licks on stage?). The first time I listened to the album, I was kinda put of with the fact that EA closes the album with a cover of the Prog Rock classic “MacArthur Park”. It seemed like such a futile thing to do, as so many bands have done covers of that track before (hey...there's even a tabla-only version on one of the Simpsons episodes, you know), but after giving it a second session, I came to understand how wonderfully the band has turned that song around, making it something quite of their own. Should be a live favourite...it's got my vote by all means! If you're even remotely into Progressive music (whether it be Rock ór Metal oriented), you nééd to check out this band (besides its own website (www.) etherealarchitect.com, the band also has pages on MySpace, ReverbnNation, and facebook, as well as some material on YouTube). Don't wait until tomorrow, do it now! I mean...get off this here site and surf to the band's website nów, you hear! One little warning though: highly infected material. You're bound to wanna get your own copy of the album, I can assure you of that... So, in conclusion, here's an album which is hereby added to my 2012 year-lists! With a delay, I know, but absolutely whole-heartedly!